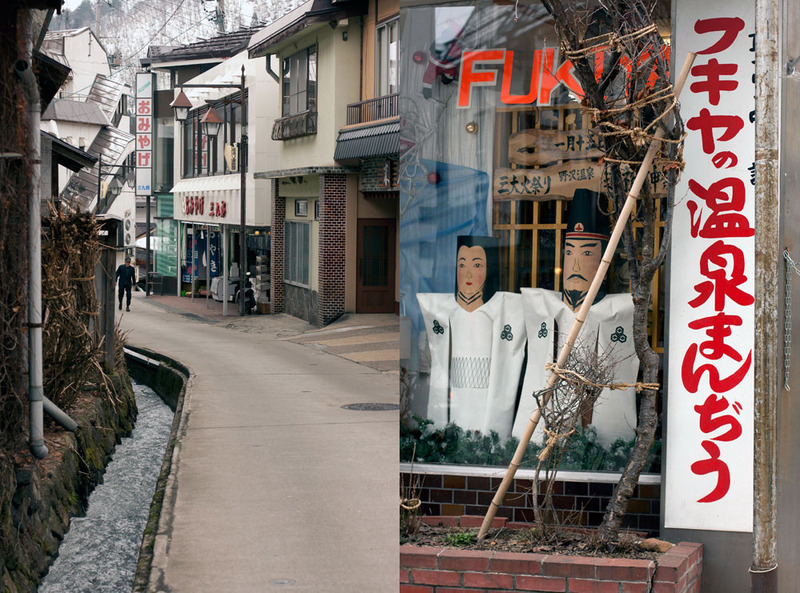 The final days of the ski season and the small Japanese mountain village is gaining back some of its normality. In the cold evening we walk up a deserted slope from our ryokan towards a warmly lit door, plastic sushi samples sit in the dusty window illustrating the menu for foreigners. Gradually sliding open the shoji door reveals a one room restaurant of traditional Japanese style floor seating and a bar. An old model television is broadcasting the local baseball game in the far corner. Baseball pitches are a common sight in Japan. Without words a gentleman motions us to sit at the bar in front of the sushi chef. His focus does not shift from making the nigirizushi and in a peculiar way we respect the lack of acknowledgement. We order an economy and superior set from a photo menu. In a fully occupied restaurant the catching subdued mood prompts us to converse with each other in hushed whispers. There is no kitchen to shout in or knock about dishes, the food is put together in front of us. No sooner does the sushi chef finish one task he precisely moves to the next, his movements demonstrate no signs of pressure and all signs of a seasoned chef. There is no denying he has perfected and mastered the sushi technique. The other gentleman serves us mattcha tea and miso soup for the wait, when he is not serving he stands by the bar watching the sushi chef and occasionally glancing back at the baseball game on the old TV. The other diners seated on the tatami mats are also watching the chef. For travellers that make it to Japan, sushi is almost like the holy grail for foodies. The Japanese have access to some of the best seafood in the world and the diversity is broad, from the scary puffer fish (blowfish) where restaurants need to be licensed to the blue fin tuna. Our unsure feeling of how to take the quiet restaurant disappears when fifteen minutes later our meals are presented on a miniature wooden boat and looking delicious. It was divine, the grilled eel was buttery, the raw tuna and salmon was plump and fresh. Actually of the raw fish was beautifully fresh. The tamagoyaki was thick with visible layers of the rolling and folding process. It was nicely sweet. Oh and the prawn also had a lovely buttery taste. 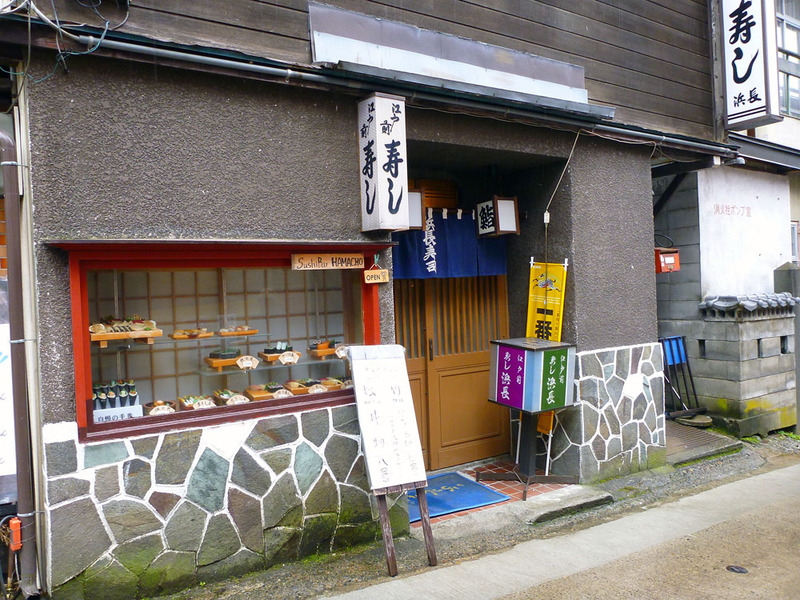 During our five night stay in Nozawa Onsen, Hamachozushi had the most irregular hours. Open one day for lunch and closed the next, we could not figure out the pattern. Point of fact, all of the businesses in the small village were a bit like that. When we saw he was open for lunch on another day, we seized the moment not knowing when he would be open again. Seated and anticipating a meal like the other night we notice the chef lay eyes on the written order and then in our direction. He placed the sashimi knife on the wooden counter, stopping in mid sushi preparation and in a vigorous tone asked us ‘you here other day’ before laughing and pointing out ‘same order, ahhhhh’. He smiles to himself as he continues to slice the fatty Tuna. He gives us four extra sushi nigirizushi! In his broken English and our limited Japanese we talk in short sentences. ‘Where you travel from’ is answered ‘Australia’. He pulls out a hand drawn map of Australia and we point to the Western side to Perth. The patrons in the restaurant find the sushi chef amusing and laugh at his animated persona, far from the serious side we saw a few nights ago. Perhaps he was happy to see us return, a sign that we enjoyed his meal. A similar incident occurred to us at the bakery on our return, the owner from our first visit had remembered our coffee order and there initial serious service turned to a friendly and open one. The two Russian girls sitting next to us join in with the translation with the sushi master and our lunch turns into a social gathering with everyone in the room participating. He watches us eat our Tuna nigirizushi and all of a sudden in a disapproving tone he tells us ‘no ginger with tuna’ ‘enjoy tuna on its own’. Since this, we no longer have ginger with tuna, savoring the tuna on its own. 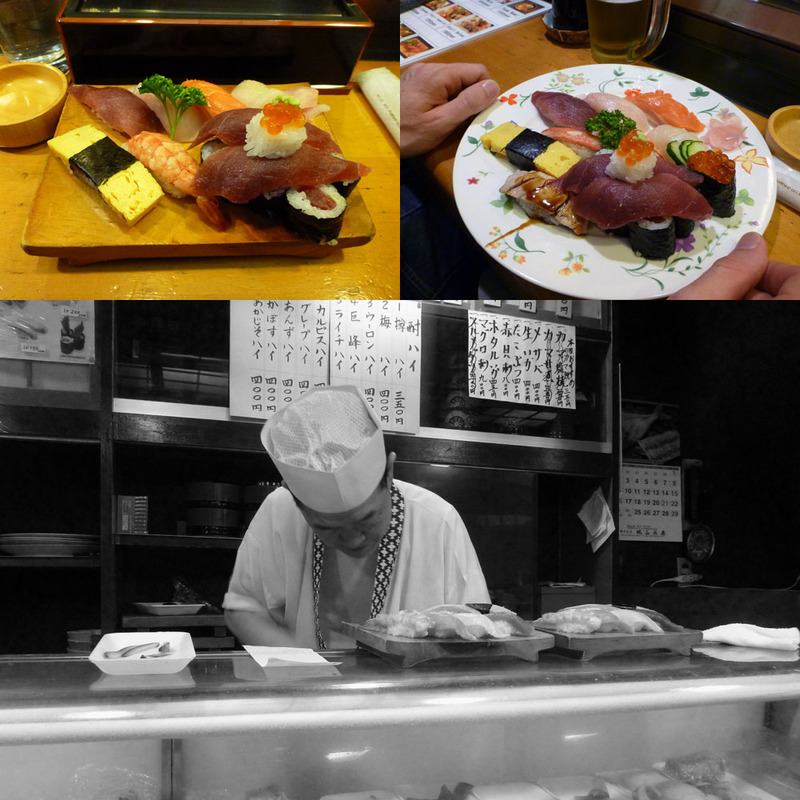 The sushi at Hamachozushi each time we visited was remarkable in quality, taste and texture. To be utterly bold the dusty little place is one of the best sushi places we have visited. It wasn’t just the meal it was the entire experience that impressed, the interaction with the chef and other travellers. To top it off, I do not think I have been served a platter of freshly made sushi in under 15 minutes outside of Japan. A clear reason to visit Japan. Fresh sushi simple does not compare to pre-prepared sushi, there is such a big taste difference between the two. The sushi portions were quite sizable and I noticed a higher fish to rice ratio with our meals. My mouth waters at the memory of the buttery textured prawn and the sweet Anago eel. The meaty tuna and refreshing salmon, I hope to be able to find equal quality in Perth. There is a slight feeling of being an outsider in Japan when one does not speak Japanese however the experience in the little sushi restaurant was impressive and heart-warming, something this Gajin tourist will not be forgetting anytime soon. 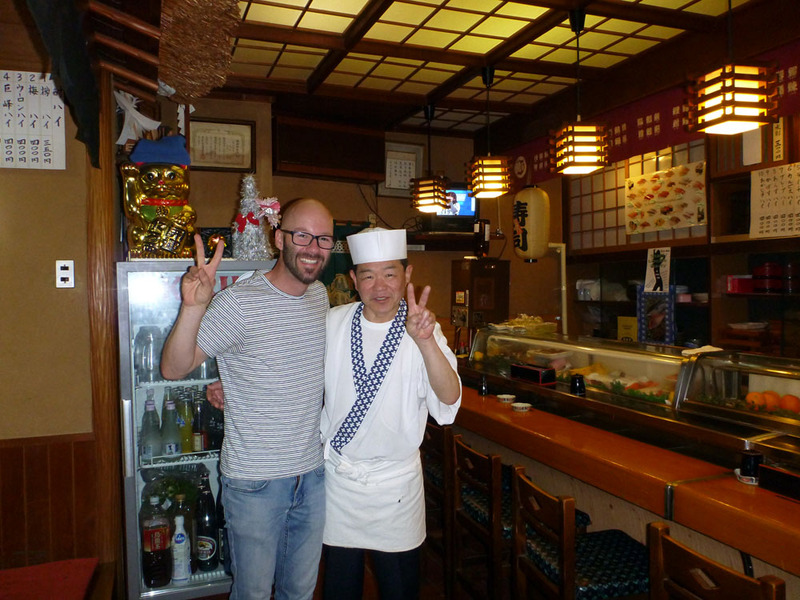 Our generated excitement resulted in a must photo of Dk with this sushi chef on our final day in Nozawa Onsen. We were actually both sad to leave, we had so much fun in his restaurant. Number three – Anago eel is unbelievably delicious, where can I find it in Perth?! I’m enjoying your blog, and your Nqzawa posts. My husband and I are travelling to Nozawa in January 2016. You ask in the post where you can find “anago eel”? I think you mean unagi (which is Japanese for Eel). You can get it at most good Japanese restaurants in Perth, but you can actually buy it on it’s own to take home from Seafresh Myaree. It’s the only place I’ve seen it in Perth, aside from a restaurant.